What is bulk marine sediment mining? In 2012 and 2014, the Department of Mineral Resources granted three prospecting rights for marine phosphate to Green Flash Trading 251 (Pty) Ltd (GFT 251), Green Flash Trading 257 (Pty) Ltd (GFT 257) and Diamond Fields International Ltd (DFI Ltd) respectively, over a considerable portion of South Africa’s marine environment. Together, these prospecting areas total approximately 150 000 km2 or 10% of our exclusive economic zone. 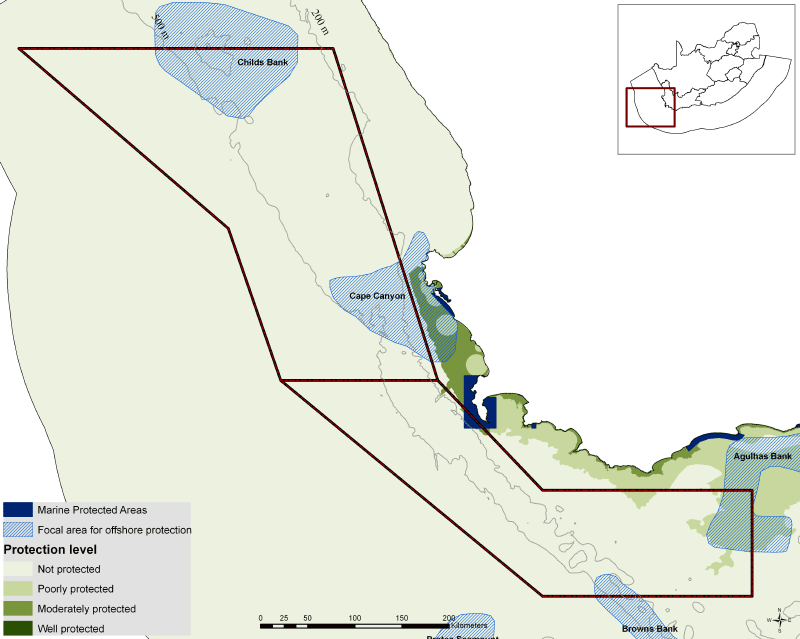 These areas coincide with several existing fishery footprints, critically endangered ecosystems and habitats earmarked for protection in offshore marine protected areas. Some of the benthic habitat types that coincide with the prospecting areas don’t exist anywhere else. Although a prospecting right does not provide a legal entitlement to a mining right, it provides an expectation that mining will be allowed. In addition to the grant of these rights, there are a number of other indications that our government plans to develop a bulk seabed mining industry in South Africa. Department of International Relations and Cooperation (DIRCO) and DMR have announced the development of a Seabed Mining Roadmap aimed at developing the seabed mining industry. Furthermore, a number of media releases allude to DMR’s intentions to develop seabed mining in our exclusive economic zone. A number of irregularities were identified and objections raised in respect of the granting of the two Green Flash Trading prospecting rights, particularly related to the potential environmental damage and negative impacts on fishery resources if bulk marine sediment mining were to proceed in future. The Environmental Management Plans prepared by Green Flash Trading, criticised as a mere ‘cut and paste’ job, were inadequate on a number of grounds, including contradictory information and little attention to content and context. The public participation process was wholly inadequate. Green Flash Trading gave little notice of public meetings, provided an incorrect venue in advertisements and did not properly consult with interested and affected parties. Many stakeholders only became aware of the Diamond Fields International prospecting right after it was granted, through a press release in Canadian media. Furthermore, the two Green Flash Trading companies are virtually identical. They were seemingly set up separately to create the impression that the owners would not have a monopoly, given the extent of the prospecting areas. This was an attempt to circumvent provisions in the MPRDA that require the Minister to refuse to grant a right if it will result in the concentration of a mineral resource in the control of the applicant. In 2012, a number of coalition partners submitted comprehensive objections to the Green Flash Trading prospecting right applications. In 2013 the Centre for Environmental Rights, on behalf of WWF-SA submitted an access to information request to DMR. That request sought to gather information related to DMR’s broader strategy and policy in relation to seabed mining and prospecting. The DMR refused to provide this information as it would ‘substantially and unreasonably divert the resources of the public body.’ WWF-SA and CER appealed the decision to refuse the PAIA request. The appeal has never been decided by DMR and was therefore deemed refused. The WWF Nedbank Green Trust is a funding organisation that supports programmes with a strong community-based conservation focus. The Trust was co-founded by Nedbank and the world’s largest independent conservation organisation, World Wide Fund South Africa (WWF SA) in 1990, with the aim to bring together conversation and community development in order to promote the ideal of people living and working in harmony with one another and the environment.